If you haven't noticed already, I love mason jars. There are countless things you can do with them and they always come in handy. 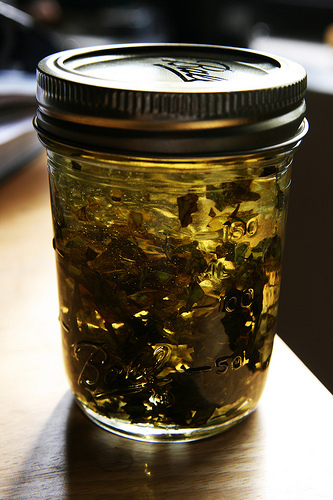 Here is a way to make you own infused liquors in smaller batches! This couldn't be more simple. Make sure your jars and produce are clean. Roughly chop up large vegetables or fruit and fill mason jar 3/4 of the way. Pour in your liquor of choice and fill to the top. Place cover on snugly and allow jar to sit for at least 1 week. Every few days gently shake the jar to mix it up a bit. Enjoy!